Somehow - having never lived or spent much more than a night there - travelling through Geneva has the familiarity of visiting an old uncle. We love the broad, bright boulevards and the efficient cafés that line them, and have never understood why people rush through it at the end of their holidays. To give you a flavour of why you should leave the chalet a bit earlier next time you’re travelling through, we’ve compiled ten of our favourite places to eat, all within a short 15-20min drive to the airport. First up Athénée 4. A top lunch venue with an amazing team and refined menu. Start your visit at the bar with an Old Fashioned expertly mixed by the multi-talented Romain. Then hit the restaurant to discover its simple, seasonal menu, with exciting treats such as poached pear on a bed of pureéd parsnips, yogurt granita and parsley'd meringue. If you fancy moving your culinary map a little south, then you can’t go wrong popping in to La Bottega in the Old Town of Geneva; just a few steps from the Grand Theatre and Parc des Bastions. Head chef Francesco Gasbarro learnt his trade in Florence, developing a modern take on the Tuscan classics. Depending on how long you have before your flight, you can pick from the three- or four-course Business Lunch, the five course Inferno or seven course Paradiso. Moving a little out of Geneva, Domaine de Châteauvieux allows you to eek-out a few more hours of Swiss mountain air. The food is seasonal, the atmosphere calm and after enjoying a Surprise Menu at the Chef’s Table, you can relax in its smoking room with a cigar of your liking. And with rooms upstairs, it’s also a good idea for an early morning flight. Another lung-clearing spot with a stunning view over Lac Leman is Auberge du Lion d’Or. Relais & Châteaux describe head chef Thomas Byrne and Gilles Dupont as the “tightrope walkers and choreographers of gastronomy”. And this place is all about Thomas and Gilles. Their enthusiasm for food comes through in everything you see and eat, creating an inevitably memorable feast. Returning to the city now for the first Indian fine-dining restaurant in Geneva. Rasoi by Vineet is a beautifully-designed venue with slick touches, like the centrepiece large tandoor oven finished in smooth granite. And the food? Well we can understand why Jonathan Meads of The Times said: “Vineet Bhatia is that rarity, an Indian chef who invents; his cooking is clear flavour, robust, gimmick free”. Moving on to a more traditional feed Les Armures offers a final taste of the mountains. Located in the historic Hôtel Les Armures, with it’s splendid mix of modern and 17th century decor, this is the place for fondu, as well as other delights such as steak tartar and fresh perch plucked straight from the lake. And to walk off the post-fondu-fatigue simply head round the corner to the Promenade de la Treille. Looking up now, Izumi’s expansive rooftop setting affords views of Lac Leman and it’s jet d’eau, as well as the distant snow-capped Mont Blanc. The Nikkei cuisine, where Peru meets Japan, is some of the best we’ve had and the sushi pate with truffle is too good to miss. 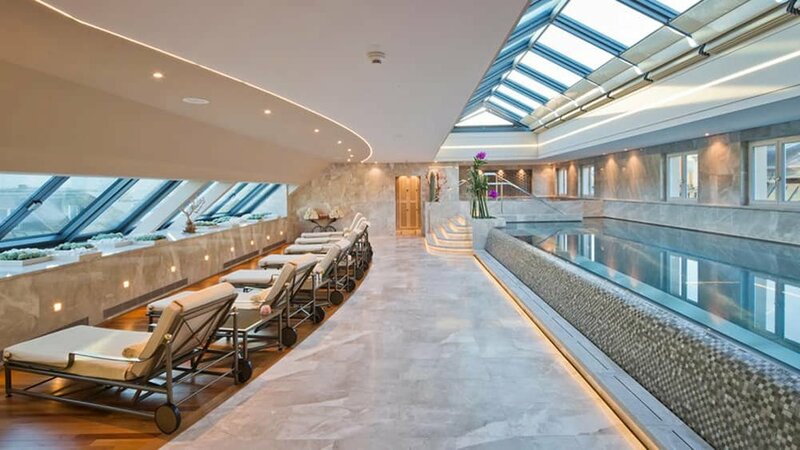 For an added bonus, as it’s attached to the Four Seasons hotel, why not take yourself (and your l’étale trunks) down to the spa for a calming plunge in the swimming pool. Recognise Le Jardin's rooftop sign? 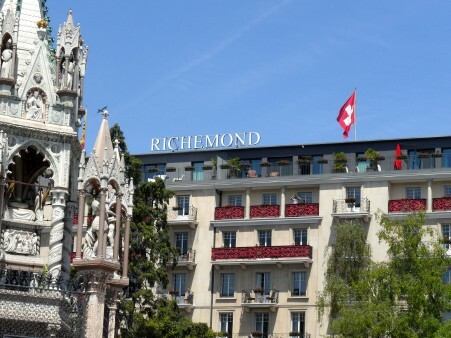 Le Richmond’s rooftop sign is a familiar sight as you drive over the pont du Mont-Blanc and Le Jardin is it’s outstanding restaurant. This is the type of old reliable eatery that you can take colleagues, family or just yourself. The menu is seasonal but you won’t find any experimentation, just great food, beautifully cooked, served by experienced waiters who can also guide you through an excellent wine list. 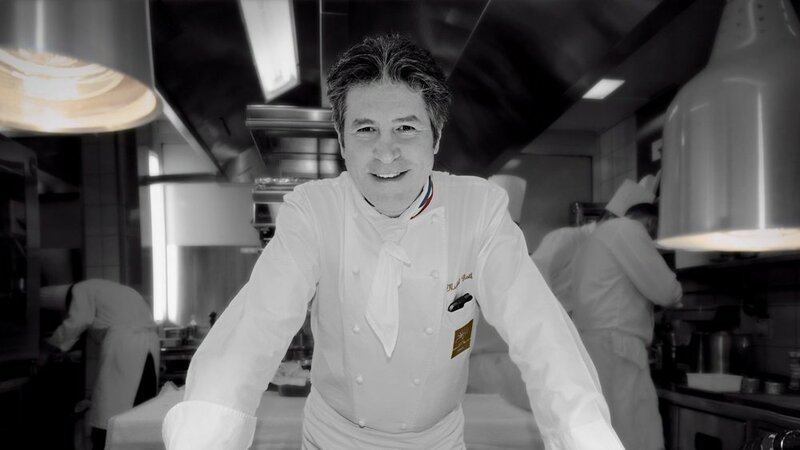 Not the first Michelin star on our list, but still managing to stand out, Bayview by Michel Roth epitomises simplicity, art and attention to detail. Anywhere that can create haute cuisine from a quiche Lorraine, deserves a visit. Having looked after Genevois since 1933, Café du Centre is guaranteed to be packed most days. The menu is extensive so make sure you give yourself an extra half-hour just to decide what to eat. And when the sun’s out, try and grab a seat on the busy terrace and enjoy a bowl of Crevettes. And finally, if you don’t have time for a full seven-course meal or a long evening watching the world, but still want a bit of calm before the GVA airport throng, head to Qu’Importe. Based in the the lively Italian quarter, you can peruse their its Romanic wine list, as well as a range of interesting cocktails and beers. And to go with that, there’s tapas, a warm ambiance and a cosy fire-side setting. We hope you enjoyed the list and that next time you’re flying home from Geneva, you can take time to enjoy some of its culinary delights. And if you already know the best places to chow-down there, or know of another city to champion, let us know and we’ll write up another shout.